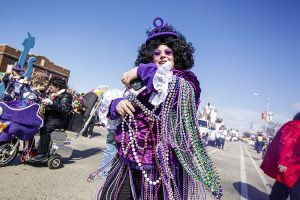 Metro makes it easy to get to the fun and festivities of the 2019 Mardi Gras and Grand Parade in the Soulard neighborhood on Saturday, March 2. For just $5, you can avoid the hassles of parking and congestion, and ride special Mardi Gras MetroBus shuttles between 9 a.m. and 11 p.m. The special shuttle will operate between the Civic Center MetroLink Station (near the Enterprise Center) in downtown St. Louis and the Mardi Gras venue. The special shuttles will run every 10 minutes and will drop off and pick up passengers in Soulard on 10th Street between Carroll and Marion Streets. The $5 round-trip shuttle passes can only be purchased on March 2, at the Civic Center MetroLink Station. Other Metro tickets and passes, such as one-day, two-hour, one-day and weekly passes, are not valid on the Mardi Gras MetroBus Shuttles. The Mardi Gras MetroBus Shuttle Pass cannot be used to ride MetroBus or MetroLink. Please leave your backpacks and coolers at home since they will not be allowed at the Soulard Mardi Gras. No food, drink or alcohol is permitted on MetroLink, MetroBus, the Mardi Gras Shuttles or on Metro property. For more information about the special Mardi Gras shuttles, contact Metro Transit Information by calling 314-231-2345 or 618-271-2345 or texting 314-207-9786, Monday through Friday from 7 a.m. to 6 p.m. For Mardi Gras parade information and other event times, visit mardigrasinc.com.